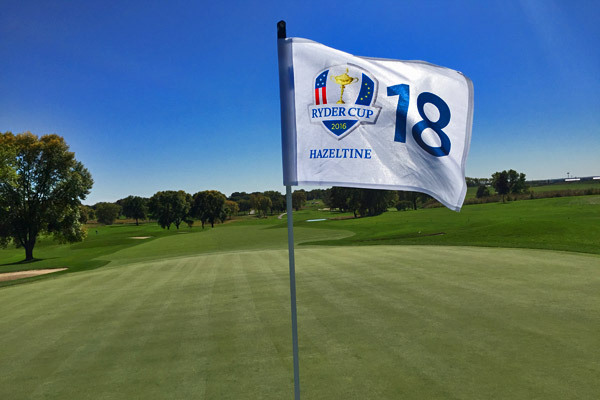 The 2016 Ryder Cup is upon us and as the respective teams get to grips with the course at Hazeltine National, we thought we’d take a look at the course, the players, history and more. If there’s something you need to know about this year’s Ryder Cup, you’ll find it below…right down to the tee times which of course you’ll need to know if you’re going to successfully plan a 3 day Ryder Cup binge in front of the TV! Designed by Robert Trent Jones Snr and measuring a whopping 7,628 yards, playing to a par of 72; Hazeltine National Golf Club is a real monster. Having first come to the fore at the US Open in 1970, the Minnesota club has since hosted another US Open (1991), as well as a pair of PGA Championships in 2002 and 2009…Tiger Woods finished runner up in both. By hosting the Ryder Cup, Hazeltine will join the iconic Pinehurst No.2 as the only courses to host a US Open, US Women’s Open, US Senior Open, US Amateur, PGA Championship and Ryder Cup. Named after the lake on which the course is routed around, Hazeltine features plenty of water and as such players will need to be wary of their course management and club selection, especially on holes such as the signature 16th which features a green perched precariously on a peninsula. Of course, as the home Captain, Davis Love III will have the final say on how the course shapes up with regards the length of the rough and the speed of the greens. With both teams chock full of world class talent though, such subtle differences in course set up is unlikely to have any bearing on the final result. 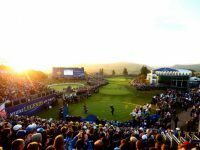 After the Miracle at Medinah, the USA paid a visit to European soil and the sublime Gleneagles resort in Scotland, looking for revenge for one of the most historic sporting comebacks ever. Things didn’t pan out the way Team USA Captain Tom Watson had planned and Team Europe, Captained by Paul McGinley and lead on the course by Ryder Cup heavy hitters, Justin Rose, Henrik Stenson, Sergio Garcia, Lee Westwood, Martin Kaymer and Rory McIlroy, cruised to a 16.5 – 11.5 win. After building a 4 point lead heading into Sunday, Graeme McDowell lead Europe out and snatched an early point. Rickie Fowler was then on the receiving end of a Rory McIlroy masterclass and Team USA were unable to build any sort of momentum, leading to Jamie Donaldson clinching victory with a stellar 9-iron that settled 3 feet from the pin at the 15th hole of his match against Keegan Bradley. Victory at Gleneagles marked Europe’s eighth triumph in the last 10 Ryder Cups and 6th in the last 7. 9 of the 12 players on Team Europe qualified outright for their spot on at Hazeltine through their individual play in the 2 seasons leading up to The 2016 Ryder Cup. Among those 9 players there were no less than 5 rookies who had never tasted Ryder Cup action before…no doubt this played a huge part in Darren’s Wildcard selection. Masters Champion Danny Willett is the highest profile rookie at the event, while Andy Sullivan, Chris Wood, Matthew Fitzpatrick and Rafa Cabrera Bello will also make their Ryder Cup bows at Hazeltine. The rookie count is heavy on Darren’s team but in the shape of Rory McIlroy, Sergio Garcia, Justin Rose and Henrik Stenson; Team Europe has plenty of heavy hitters, many of which are rounding into top gear just in time to take down Team USA. Sergio is Sergio and always saves his best golf for the Americans, while Henrik Stenson followed up his win for the ages at The Open with a Silver Medal at the Olympics, where coincidentally he just lost out to Justin Rose who took home Gold. Finally we have Rory McIlroy, who produced the kind of golf seemingly formerly reserved only for Tiger Woods to capture the season ending Tour Championship on the PGA Tour, along with the FedEx Cup and the $10 million bonus that comes with it. We’d imagine Rors probably made his way to Hazeltine in some style! As we already know, only 9 of the 12 men representing Team Europe at this week’s Ryder Cup qualified automatically, with the 3 remaining players relying on Wildcard picks from Captain Clarke. Phil Mickelson aside, Westwood is by far the most experienced active Ryder Cup player. Hazeltine will mark his 10th appearance in the event, with only Mickelson (once Hazeltine has been and gone) and Sir Nick Faldo having played in more with 11 a piece. And it’s not just the wealth of matches he’s played…Westy always saves his best golf for the Ryder Cup and has an impressive record to say the least. So impressive is Lee’s Ryder Cup record in fact, the he’s in with a shout of matching or breaking countless Ryder Cup records this week. A total of 2.5 points for example will see Lee make his way home as the man with the most Ryder Cup points ever scored. Not too shabby. Lee has fared well as a Wildcard in the past too. In fact since 1995, he’s been the most successful Ryder Cup Wildcard with a win ratio of 67% from his two appearances as a Captain’s pick. And while there are those who are skipping to the beat of the “Westwood’s form is terrible” drum, that’s simply not the case. Granted Lee isn’t playing the golf that saw him propel himself to the position of World Number One a few years back but looking at his results in 2016 suggests there is very little to worry about…. Following his tie for 2nd at The Masters, Westy’s results are as follows: T32 (US Open), T11 (French Open), T22 (Open Championship), 85th (PGA Championship), T27 (Czech Masters) and 4th (European Masters). That string of results is good enough for Lee to sit in 10th position in the European Tour’s Race for Dubai…not bad for a man who is playing so badly according to the arm chair fans. Captain Clarke knows exactly what he’s getting with Westwood, and that his influence will extend far beyond the fairways, especially when you consider there will be a total of 6 Ryder Cup rookies representing Team Europe. Like Westwood, Kaymer is a former World Number One and with 2 major championships to his name, he’s clearly a man for the big occasion. Kaymer too has been labelled by the masses as a man out of form but again, like with Westwood, if you look at his recent results from 2016, that simply isn’t the case. A tie for 36th at The Open was followed by finishes of T7 at the PGA Championship, T15 at The Olympics, T6 at the European Tour’s Made in Denmark event, T20 at the Italian Open and, most recently, a solo 6th finish at the Porsche European Open. Kaymer isn’t short of Ryder Cup experience either and while he might not boast a record as impressive as Westwood’s, the German will head to Hazeltine to make his 4th Ryder Cup appearance. Kaymer has a solid record too, with 4 wins, 3 losses and 3 halves to his name. Who could forget Kaymer’s contribution at the Miracle at Medinah? In somewhat of a slump heading into the Ryder Cup that year, the German showed ruthless efficiency in helping the Europeans complete a history-tying come-from-behind victory, eventually holing the put that retained the cup on that historic Sunday. Like Westwood, Kaymer has Captain Clarke’s complete trust. WHY THOMAS PIETERS OVER RUSSEL KNOX? Experience of course is key, as is the team dynamic, and while Russell Knox (the most notable omission from Team Europe) won twice on the PGA Tour in late 2015 and most recently in August 2016, moving into the Top 20 in the World Golf Rankings in the process, he has openly admitted to not being overly familiar with any of the Europeans. In addition to not being as close to his European counterparts as Captain Clarke would’ve wanted, Knox also elected not to travel to Denmark to compete in the European Tour’s Made in Denmark event (won by Thomas Pieters) which offered valuable Ryder Cup points, but rather stayed in the USA to play in The Barclays, understandably chasing a hefty paycheck and a crack at the $10 million bonus eventually won by Rory McIlroy. Darren also saw lots of Thomas Pieters in recent weeks, including playing alongside the young Belgian at the Made in Denmark event. The Ryder Cup skipper has since expressed how impressed he was with how Pieters played in his presence. It was hardly a secret as to why Clarke was playing with him, so when Pieters flourished under the Ryder Cup Captain’s microscope, shooting a sparkling 62 in his company before sealing the event with a hat trick of birdies, he had booked his ticket to the USA. Sadly I think US are going to win it. These things go in cycles and Europe have had a great time of it lately. US team look to be in pretty good form and I thought Davis Love did a pretty good job 4 years ago at Medinah. It is just Europe were inspired. Score 15-13 to US. Top points scorer for Europe & USA? Henrik Stenson for Europe. The win at the Open has really given him belief. Will be immense with Justin Rose in Fourballs and Foursomes. Patrick Reed for US. In very good form, and really thrives on Ryder Cup atmosphere. Danny Willett for Europe. Had a good matchplay record as Amateur and has started to regain a bit of form lately. And of course, he is the Masters champion. Ryan Moore for US. Another with good matchplay record. Done well at WGC Matchplay in the past. Good pick by Love because he is in form. Team Europe need to hole a 10-foot putt on the last to retain The Ryder Cup…who would you pick to hole the putt? Seeing as Ian Poulter is not actually playing this time, it has to be the hero of Medinah, Martin Kaymer. Apparently it didn’t even enter his mind that he would ever miss that putt! USA to win 15-13. I’m afraid I think our rookies will struggle on their own on the last day. I’m going to go for Patrick Reed to lead the way for America, he seems made for the Ryder Cup. With McIlroy being top point scorer for Europe, he’ll go unbeaten over the week. I think that Moore will be best rookie points wise. However, I think Chris Wood will turn the most heads in the US, similar to Colsaerts in 2012. Justin Rose on the last to win it.. Dealt with pretty much every high pressure situation in golf. I think the USA team have too much in their locker at the minute and their players are hitting form just at the right time, so I think the US will win the 2016 Ryder Cup. However, I do think we can form some good pairings for the four balls and foursomes so I think the score will be tight come Sunday. But on the singles, I expect the US team’s form and experience to shine through and to take the Ryder Cup 15-13 overall. Europe’s top point scorer has to be Rory McIlroy. Following his recent FedEx Cup Championship win, he looks back to his best and when he’s this hot, there’s no man to match him. The top point scorer for USA will be Patrick Reed. He is a match play fanatic and on home soil, he is sure to be pumped up. I’m sure his game will peak for the Ryder Cup and I think he will be a valuable player for the US during the four balls and foursomes, especially. For the best rookie, I’m reckoning an unlikely Matt Fitzpatrick for the European Team. He was part of a winning EurAsia Cup team this year and formed a solid partnership with Lee Westwood, so I think Fitzpatrick could impress in the four balls and foursomes. On the American Team, I think Ryan Moore will shine ahead of Koepka, as his recent form in the FedEx Championship suggests he could be peaking at the right time. I’d have Justin Rose standing over the 10 footer. He’s had a great few years of golf and some memorable Ryder Cup performances, and with his recent Olympic win I’d definitely feel safe with him bringing it home. So many people have been suggesting The US team is too strong for Team Europe and that they will The 2016 Ryder Cup. Having thought hard about though, I think that Team Europe still has the talent and experience to beat The US team. Yes, there may be a few rookies, but there is also great experience with the likes of Garcia, Stenson, Kaymer and one of Europe’s greatest Ryder Cup players Westwood. 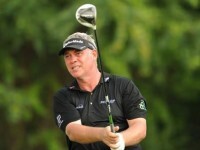 Captain Clarke must get his pairings right, perhaps he will go for a mix including an experienced player with a rookie. I’ll go for 15-13 in Europe’s favour. For Team Europe, I am going to go with Lee Westwood. He has been getting a fair amount of criticism for being picked, however he is Ryder Cup record is simply incredible and I’m sure he will be silencing the haters this weekend. For Team USA, I will have to go with DJ. He is no. 1 American on the team, and this year claimed his first major which would have given him major confidence going into The Ryder Cup. For the top rookie, I will go with Matthew Fitzpatrick. He may be youngest player in Team Europe but he has the game and mentality of an experienced player. Who he is paired with is crucial, I would suggest one of the experienced players, perhaps Westy. I would have to go with Henrik Stenson, he is the cool cat of Team Europe and I’m sure that he would remain calm if he had the putt to win The Ryder Cup. I think the winning score for The 2016 Ryder Cup will unfortunately be 16-12 to Team USA. The current odds place Europe at 2/1 and I’ll happily accept that the bookies know more than me! I think it’ll be very close after the four balls and foursomes but fear that home turf and their historical singles record will see the USA win by a small margin. I can’t see anyone on European Team scoring more than Rory McIlroy, he’s in fantastic form of late and will be a formidable foursome / four ball partner with his sensational driving and ball striking. His putter seems pretty hot as well at the moment following some work with Phil Kenyon. The USA team look set to be led by Dustin Johnson. He’s had a pretty incredible year of golf and looks like he’s getting better and better. Yes, he’s got the driving ability to change most golf courses but his all round game is arguably better than any at the moment and I certainly wouldn’t fancy facing him! I think Andy Sullivan will be Europe’s best rookie, he’s had experience in team matchplay at The Walker Cup and he seems to have a bit of a Poulter character which should see him produce the shots when needed. For the USA, it looks like Ryan Moore will be the man most likely to make an impression. He reached the Quarter Finals of the World Golf Championships this year and has had amateur successes in winning the Public Links Championship in 2002 as well as the NCAA Individual and US Amateur in 2004, as well as representing the USA in the 2003 Walker Cup. Got to be Martin Kaymer, he’s been there and done that, I still can’t believe how cool he was when he holed it at Medinah! I’m going with my heart in opting for a Team Europe win, however my head tells me that the American’s have put a very strong team together and this losing streak they are on cannot go on forever, especially at a home Ryder Cup – so i’ve gone for the slimmest possible margin required for a European victory! Europe – Rory McIlroy – It’s not been a vintage year by Rory’s very high standards, but i’m always a fan of form when it comes to golf predictions. Rory’s FedEx win last weekend surely shows he is finding his game at just the right time and given this will be his 4th Ryder Cup, i’m hoping as a European that he turns on the style at Hazeltine! USA – Dustin Johnson – Not exactly a stretch to pick the top ranked American to be their top points scorer, however, DJ does have a reasonably good record of 4 – 3 in his previous two Ryder Cups, including a perfect 2 – 0 from his singles outings. When on form, there can sure be no more intimidating player to face in a match play situation than the long hitting American, and that is why I am backing him to lead their points charge. Matt Fitzpatrick – i’m going for a bit of an outsider here, especially given that the reigning Masters champion is one of the other rookies. However my justification is based on Matt’s record as an amateur, where matchplay competitions are much more prevalent. He rose to prominence with a number of high profile performances as an amateur, however, winning the U.S Amateur in 2013 in particular shows that he can excel in matchplay situations on American soil. I’d go with Martin Kaymer personally. The picture of him stood over that putt to complete the ‘miracle at Medinah’ will live long in the memory of all those who were watching. You could look at stat after stat for something like this, but any player on Team Europe is capable of holing a given 10 foot putt. A situation like this almost 100% mental and on that basis I would go with someone who has shown that they can handle that sort of pressure! If this has got you in the mood for The 2018 Ryder Cup find out more with Your Golf Travel for our exclusive experiences including tickets, accommodation and hospitality.